LOS ANGELES…Awesome world-class hotel living at the Century Plaza Hyatt Regency on the Avenue of the Stars. Spend time on the UCLA Campus, stroll Westwood Village, Venice Beach, Beverly Hills and Rodeo Drive. 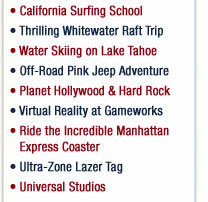 You'll have an awesome time taking the Backlot Tour at Universal Studios. Chill out on the Jurassic Park Adventure, the Simpsons virtual reality coaster and the Revenge of the Mummy, the world's scariest indoor ride! Dine in style at City Walk. You'll have a whole afternoon and night to get your Disneyland fix...from Space Mountain to Pirates of the Caribbean to Matterhorn Bobsleds, you'll ♥ the Magic Kingdom! You can be on stage when you enjoy dinner and the show at the very hip Improv Comedy Club. 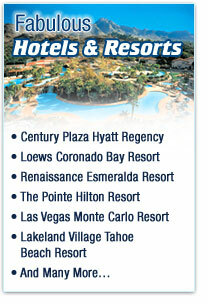 SAN DIEGO…You’ll enjoy two sun and fun-filled days at the spectacular Loews Coronado Bay Resort. Three outdoor pools, direct access to the beach on the Pacific, and a great health club are just the beginning! Learn to surf with the Surf Divas! The professional instructors at California’s premier surfing school will have you riding the waves in no time! In the evening you’ll gear up for duplex Laser Tag battles at Ultrazone. Tour the world-famous San Diego Zoo, home to thousands of exotic creatures. PALM SPRINGS DELUXE RESORT... Two fabulous days at the Renaissance Esmeralda Resort and Spa...great watersports, tennis, outrageous fitness center, multiple pools and more. At night you’ll cheer on your friends at our own Karaoke club.